Syrian hamsters can make excellent pets. They can be very active with great personalities. If raised and handled properly they�ll be your friends for life. Here are a few tips to get your pets started in their new home. 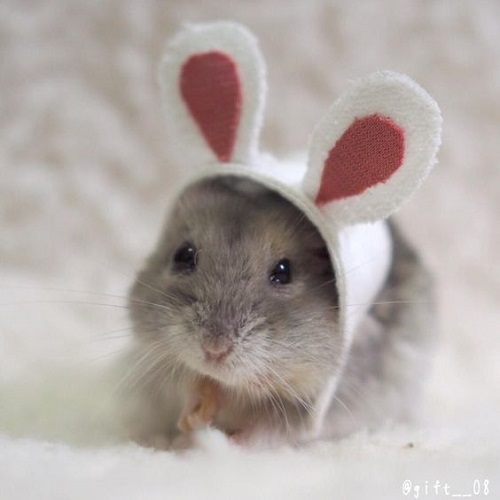 Syrian hamsters must live on their own as they are territorial mammals and will start to fight with each other once they have reached maturity, which is between 8 and 12 weeks. Syrian hamsters are nocturnal which means that they are most active at night, their life expectancy is between 1 and 2 years, but they have been known to live much longer. Do allow your pet to settle in for 24 hours before handling it for the first time. Play with your hamster as often as possible, when handling it be gentle and stay close to the floor. A member of staff will show you how. Exercise is essential, let your hamster have a supervised run around indoors as often as possible. A play ball is an excellent way for them to explore your house safely (use for only 20 minutes at a time). Do keep your pet indoors out of direct sunlight, in a room with a steady temperature and no draughts. A bedroom or lounge is ideal. 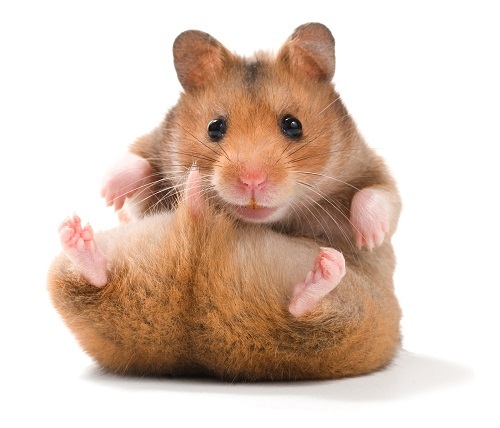 Do check your hamster�s food and water twice a day, making sure you clean any poo and woodchips out of its food bowl. Do clean the cage thoroughly at least once a week with petsafe disinfectant. Make sure you clean everything your pet touches. Use a litter scoop to make this easier. Don�t feed LETTUCE or AVOCADO as these can be harmful. 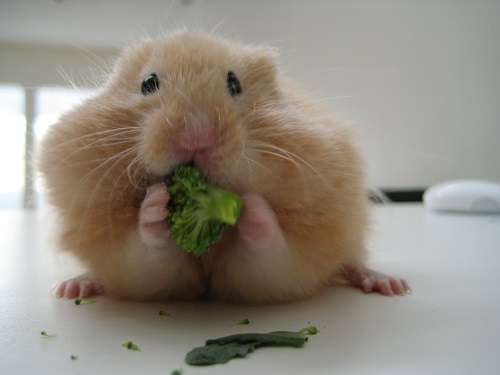 You can give hamsters very small amounts of fresh fruit and vegetables, but no more than twice a week. Don�t keep them near televisions or stereos as these can produce high frequency sounds that will irritate them. Don�t ever use aerosol cans near them as they can produce toxic fumes. Don�t overcrowd the cage with toys, although a few toys are a good idea. Overgrown teeth: Syrian hamsters can suffer with overgrown teeth that may have to be clipped by a veterinary surgeon. Always make sure there is plenty of gnawing material available. Hibernation: If hamsters are kept where the temperature drops below 5 ̊C or 40 ̊F they can go into hibernation. They may appear to be asleep or even dead. 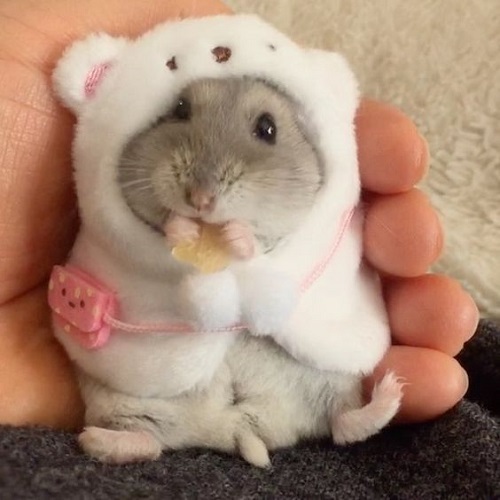 The temperature must be raised gradually by placing the hamster on a covered heat pad or hot water bottle, no more than 32 ̊C or 90 ̊F and the hamster should wake up. Veterinary advice should be sought if ever you think your pet appears lethargic or ill in any way. If you answered no to any of the above your pet may require veterinary attention. Cage: Hamsters need a lot of room. The absolute minimum suggested cage size for your hamster is 59cm x 36cm x 25cm base size, however this should have at least one to two platforms/ladders/tubes included for extra space. The bars should be no more than 12mm apart or they may get their heads stuck or escape. Exercise wheel: Hamsters are full of energy and can run up to 4 miles in a day, so a wheel is essential to keep them happy. We recommend a minimum wheel size of 12� � if your hamsters is curving their back when running in their wheel then it is too small and you should invest in a large one to avoid health issues. It is important that many complete cages on the market come with a wheel suitable only for a juvenile hamster � a larger wheel will be needed. House: Syrian hamsters need a house in their cage so that they can hide away and sleep in peace. Substrate: A good substrate is very important to soak up urine and protect their feet. Good substrate examples are dust extracted rodent safe wood shavings or Carefresh. Bedding: It is important that you only use an animal safe bedding, which should be placed in their house. We do not recommend fluffy fibre bedding types as there is a risk of them getting their limbs tangled or ingesting the material. Water bottle: Make sure your pets can reach the spout, and refill it daily to monitor their drinking. Food bowl: Stainless steel or ceramic are best, as they are hygienic and can�t be chewed. Food: Syrian hamsters are omnivores, so should be fed a complete hamster mix. It is vital that animals are weaned gradually onto any new food. They should be fed only a teaspoon of their food each day to prevent obesity. Wood gnaws: Like all rodents your pets� teeth grow continuously, gnaws are essential to keep their teeth trim. If your hamsters doesn�t appear to be using their wood gnaw, it is a good idea to try different types to find which ones they like best. Treats: Feed treats every now and then, but not too often � remember a teaspoon of food a day! Toys: To stop your pets getting bored while you�re away toys are vital to keep them active and stimulated.